Since before recorded history, the California grunion have been performing their forbidden dance of love from Santa Barbara down through Baja California. When the tide is highest between March and August during the full and new moons, the female fish beaches herself in the wet sand and begins a belly dance that half submerges her head-up. The male grunion also comes in with the tide, wrapping himself around the female and depositing milt to fertilize the eggs that she has laid in the sand. As momma grunion works her way free, sand covers the eggs and then both lovers are then swallowed up by the next crashing wave like Burt Lancaster and Deborah Kerr. As romantic as this interlude sounds, the whole process takes place in the time it takes two waves to hit the beach and their act of love is consummated alongside sometimes thousands of their piscine counterparts in a veritable aquatic version of Plato's Retreat. Even though the lurid beach invasion of thousands of silvery fish flopping about in the moonlight is spectacular to watch, many Southern Californians have never seen this aquatic ritual. 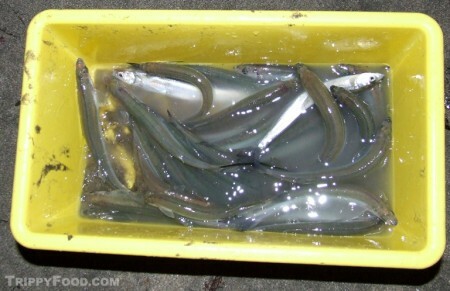 In order to ensure the perpetuation of the species, the grunion spawns (or "runs" as they are popularly called) can be observed during the entire season, but the fish can only caught in April and May. The fishing method is simple by law - a fishing license is required and you can only take the fish by hand. Like the running of the bulls in Pamplona, the running of the grunion can be fraught with peril, although instead of horned bovine stampeders one must deal with sometimes hundreds of grunion fishermen rushing to the water's edge in a maddening melee in order to catch as many fish as they can before the grunion get spooked and decide to call it a night. In San Pedro, California the Cabrillo Marine Aquarium runs a program called Meet the Grunion. Around 8 PM, participants are let into the aquarium where they can see tanked grunion (as well as the aquarium's regular exhibits), watch an educational film and learn about the fish and its unusual mating habits. Just before the run starts (usually after 10:00 PM), the crowd is led to the cove on Cabrillo Beach where they are asked to refrain from making noise or shining flashlights as waves of the fish arrive in order to ensure the maximum number of fish. At the staff's command, the crowd makes a mad dash to the water to scoop up the fish. The number of fish that arrive is unpredictable; on some nights Bubba Gump wannabes may end up with a single fish or none at all. On my recent visit, I walked away with a sizeable catch (approximately 25 fish); before taking the catch home, the Aquarium has a lighted booth set up where they will milk your catch for the eggs and milt which they will use to fertilize, hatch and release tens of thousands of the fish. 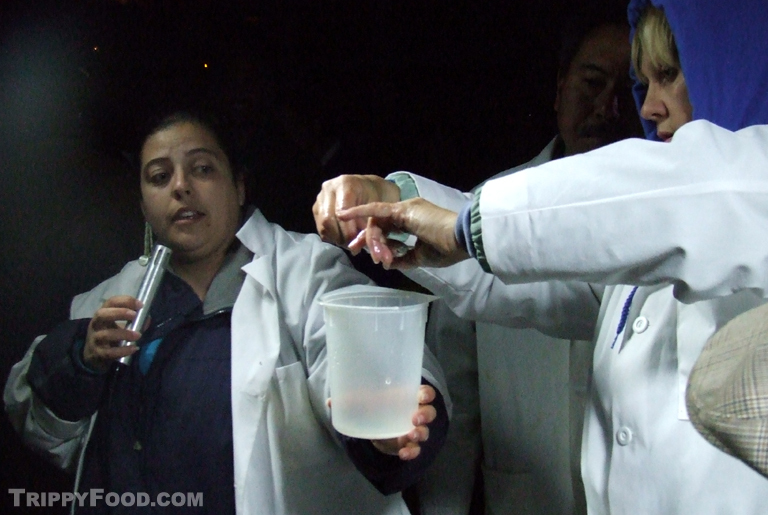 The program costs about $5, but although grunion fisherman are free to hit any beaches along the lower California coast to give it a go on their own the educational aspect alone at the Cabrillo Marine Aquarium is well worth the money spent. 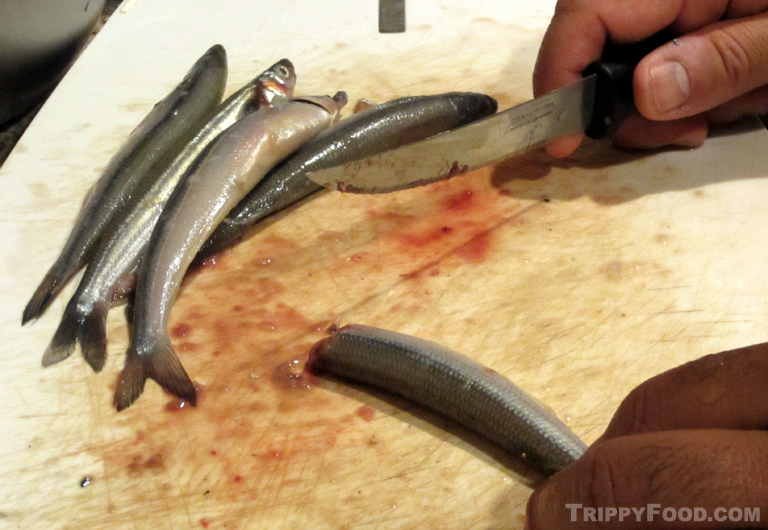 With a decent catch in tow, I had to figure out how I wanted to prepare the fish. 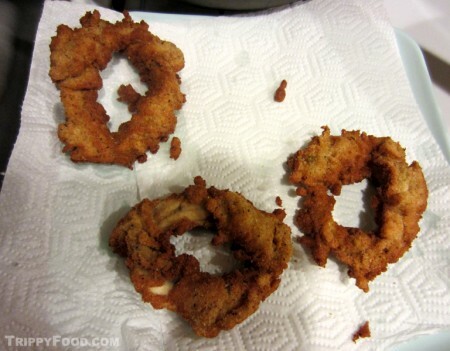 Since I seldom do anything straightforward or normal, I decided to create a dish that would be a play on words in true pun fashion: grunion rings. As simple as this sounds, it was extremely labor intensive - I had to behead and betail each one, scale and gut it and try to remove as much as the tiny-boned spine and ribs as I could. Once I had a mess of tiny filets, I pinched the head end of one around the tail end of another and fastened them with a knotted chive (which I found to be the perfect ingredient to play into the onion pun). Each ring-of-three was dusted with flour and then coated with onion ring batter made from a recipe I found online. 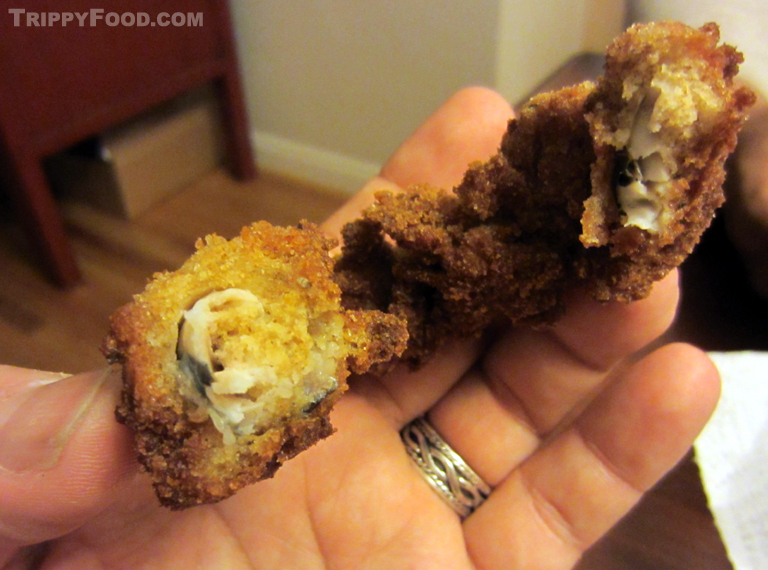 A dip into the hot oil bath was all that was left to create the golden brown grunion rings. The finished product - grunion rings! The fish itself was delicious - the flaky, mild white flesh held up well, although the taste was so delicate that the thick application of the batter almost totally subdued it. We also dredged some of the butterflied filets through the batter and fried them directly resulting in a thinner coating that allowed more of the flavor of the fish to cut through. The arduous preparation was worth it, but if you’re simply curious about how the fish tastes a catch of three or four pan fried would do the trick, and for those who don’t like to see their dinner alive first, considers the fun of simply observing the run or catching and releasing. The sport is kid-friendly (although it undoubtedly means a late bedtime) and a fishing license is not required for residents under the age of 17. NOTE: This cost for admission to Cabrillo Marine Aquarium was provided by the venue. The content provided in this article was not influenced whatsoever by the organizer of the event. 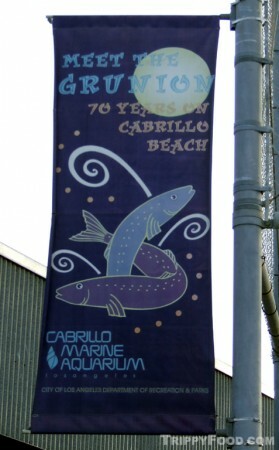 This entry was posted in USA and tagged Baja, batter, Cabrillo Beach, Cabrillo Marine Aquarium, California, chives, eggs, fish, grunion, grunion rings, grunion run, Meet the Grunion, milt, San Pedro. Bookmark the permalink. 2 Responses to Run, Grunion, Run! You, sir, are the Lord of the Grunion Ring!